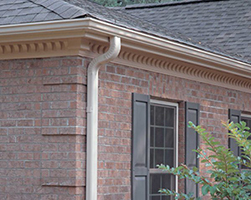 Mid-America's Dentil Trim elevates your home's curb appeal, with attractive textured depth. The deep evenly spaced notches in the Dentil Trim provide a visually-interesting inter-play of light and shadow, adding value to your home. Scalloped Tooth takes a graceful, curved approach to the traditional dentil style. While Square Tooth keeps with the style of traditional dentil, but elevates the look by having deeper, square notches. Installation is simple and ensures a perfect custom fit with a tasteful exterior. Made from fade resistant vinyl, these trim pieces are completely maintenance free. No scraping, sanding or painting is needed. Each Dentil Trim is engineered and manufactured in the USA and backed by a 40-year warranty, making these the perfect addition for your home.